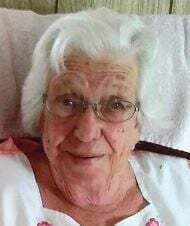 Hazel Oleta Pollard of Hansen, Idaho passed from this life to her eternal reward on Friday, January 4, 2019 at the home in Hansen, Idaho, at the age of 88 years, one month and five days. Hazel was born on November 30, 1930 in Shot Paria (Township), McAllister, Oklahoma to Alvin and Alice Gray. Hazel and Keith were married on January 26, 1949 in Elko, Nevada. Hazel was a very significant part of Keith’s life as she was his care giver in his last months. Hazel continued living in the home in Hansen, Idaho, it was her home for the past fifty years. Hazel for the most part of her life was a homemaker and loved to care for her children and later her grandchildren. Hazel was happiest cooking large meals and having all the family over for supper. Hazel was a member of the Hansen Assembly of God Church, in Hansen, Idaho, after Keith passed, she attended Magic Valley Worship Center, in Twin Falls Idaho. Hazel gave her life to Christ many years ago in the Hansen Assembly of God Church, and was baptized in water along with her husband Keith, south of Hansen. Hazel’s family has a comfort knowing that she is with her Lord and savior, Jesus Christ. Hazel is survived by her children, son, Jim and wife Pat Pollard of Jerome, Idaho, son, Jerry and wife Wanda Pollard of Amarillo, Texas, daughter Sherry and husband Joe Phillips, of Jerome, Idaho, son, Larry, and wife Cherri Pollard, of Medford, Oregon, son Dennis, and wife Ristsuko Pollard of Sacramento California, and son Tim and wife Bonnie Pollard of Kimberly, Idaho, one brother Bob Stephens and wife Shirley of Oklahoma City, Oklahoma, one sister in law, Artis Pollard of Jerome, Idaho. 13 grandchildren, 21 great grandchildren and a host of nephews and nieces and many close friends. Hazel was preceded in death by her husband, Keith Pollard, her parents, four sisters and one brother.